Dr. Dirzus is a member of the VDI's "Technology and Society" division management team and is responsible for Department 1 with four VDI societies in which more than 3,500 experts work on an honorary basis. 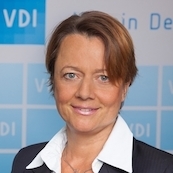 In the VDI/VDE-Society for Measurement und Automatic Control, in which activities on Artificial Intelligence, Autonomous Systems and also Industry 4.0 are bundled and coordinated she is responsible for the strategy and all standardization as well as public relations work. Dr. Dirzus studied mechanical engineering at Aachen University and received her doctorate at the Laboratory of Machine Tool of Prof. Dr. Günther Schuh. There she worked in the field of production planning, simulation and optimization. She subsequently worked in knowledge transfer, including as Managing Director of the WZLforum at Aachen University and the RWTH International Academy.